Expedition 54 Commander Alexander Misurkin (far left) hands over command of the station to fellow cosmonaut Anton Shkaplerov (far right). In the background (from left) are astronauts Mark Vande Hei, Norishige Kanai and Scott Tingle. Expedition 54 Commander Alexander Misurkin handed over control of the orbital laboratory today to fellow cosmonaut Anton Shkaplerov during a traditional Change of Command ceremony. Misurkin is returning to Earth tomorrow with NASA astronauts Joe Acaba and Mark Vande Hei after 168 days in space. Landing day begins Tuesday when Misurkin, Acaba and Vande Hei say farewell, enter their Soyuz MS-06 spacecraft and close the hatches at 2:50 p.m. They will don their Sokol launch and entry suits, check for air and pressure leaks and undock from the Poisk module at 6:08 p.m. The Expedition 54 trio will then parachute to a landing in south central Kazakhstan at 9:31 p.m. EST (Wednesday at 8:31 a.m. Kazakh time). NASA TV will broadcast all the landing activities live starting at 2:15 p.m.
Expedition 55 officially begins when Misurkin and his crewmates undock. 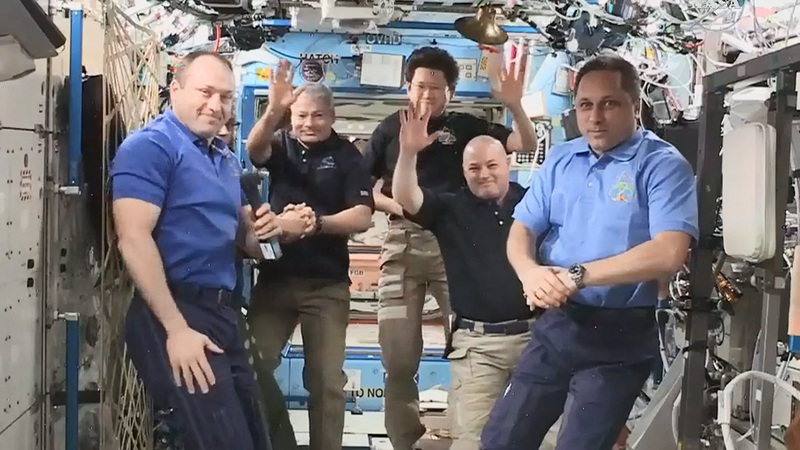 Shkaplerov of Roscosmos is staying behind as commander until June 3 with Flight Engineers Scott Tingle of NASA and Norishige Kanai of the Japan Aerospace Exploration Agency. A new crew training in Russia is getting ready to replace the Earth-bound station residents in late March. Expedition 55-56 crew members Oleg Artemyev, Ricky Arnold and Drew Feustel are preparing for their March 21 launch to the station from the Baikonur Cosmodrome in Kazakhstan. They will greet their new crewmates March 23 after docking to the vacated Poisk module inside the Soyuz MS-08 spacecraft. Feliz regreso a casa… Our earth .. Expedition 54. Mucha salud para el grupo. Feliz regreso a casa… Our earth … Expedition 54. Mucha salud para el grupo. Comes home we r waiting for u!!! Bon voyage, good luck, and blessings to the astronauts and cosmonaut returning to Earth. I follow your progress on the ISS web site and love to start my day watching the Earth through the HDEV camera on ISS. Thank you all for what you are doing for all of us. We Brazilians wishes a good trip for all of u. See u here our earth.